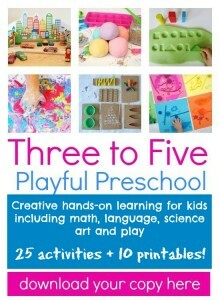 Here is an activity your children will love to do in the lead up to or during the Summer Olympic Games. 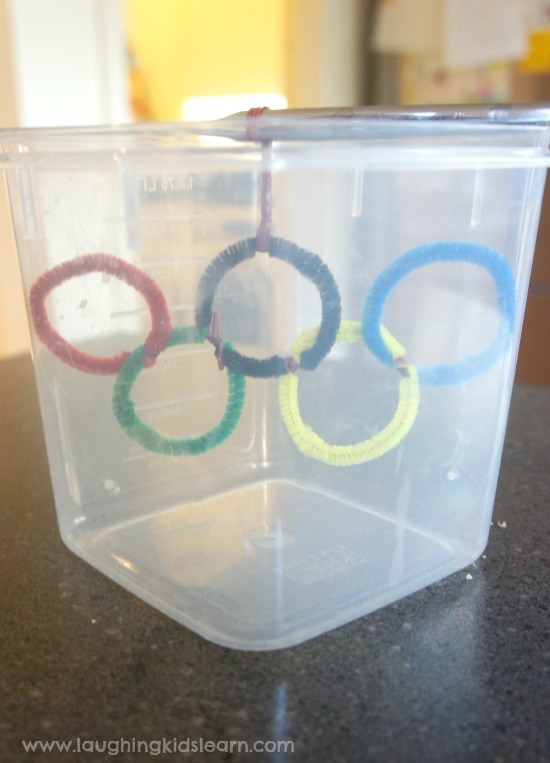 It’s a simple science activity making Olympic ring crystals! 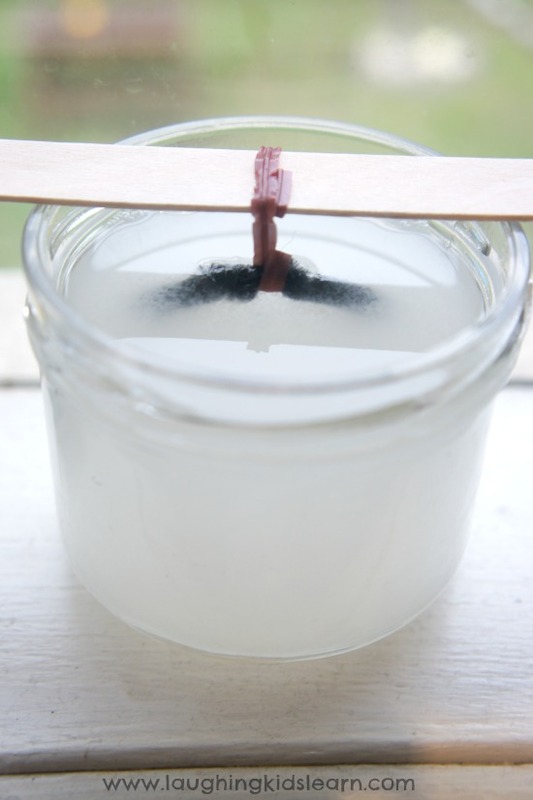 It’s very easy to do and your child will be able to observe crystals growing within the hour. I’m sure you’ll agree that these crystals are absolutely gorgeous and it’s hard to believe that they can be so easily grown in your home or classroom. 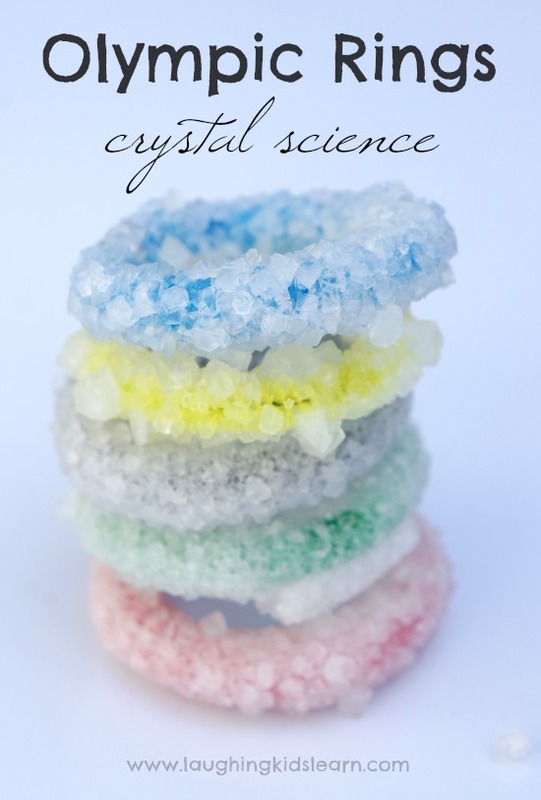 This approach to growing crystals does use Borax, which you can ready more about here. 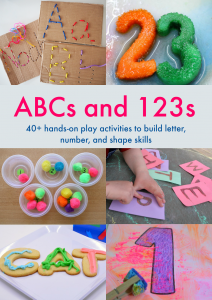 Of course you don’t have to make Olympic Rings like we did, you can make whatever shape or word you like using the pipe cleaners. I decided making crystals was a fun and unique way to talk about the Olympic Rings with Possum (aged 4.5 years) and use this scientific approach to sharing with her why they are so significant to the games. 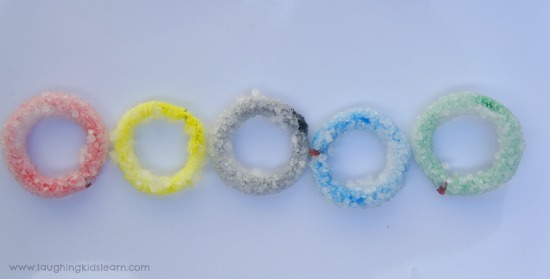 Begin by cutting your pipe cleaners in half and moulding them into a circular ring shape. You might choose to link them together (as I did at the end of this post) or make them as individual rings, which I found created larger crystals and was a whole lot easier to do. I didn’t have any string so I had to be flexible and use….okay, so they are bread ties, but it worked just as well – hahaha. I tied it to the pipe cleaner ring and a paddle pop lolly stick so it hung down into the jar, as you can see above. 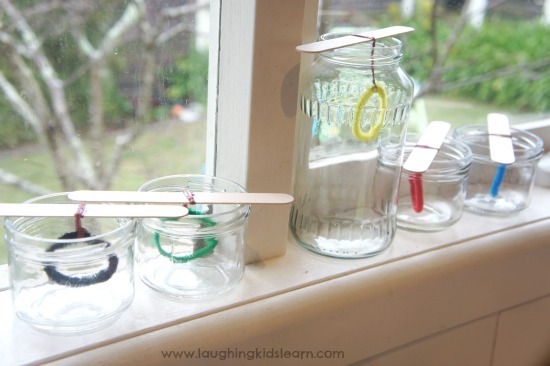 I then added 2 cups of boiling water with 1/2 cup of borax powder and stirred it very, very well before adding it to the jars with my hanging pipe cleaners inside. It’s very important that you make sure the pipe cleaner is completely submerged as any parts of the pipe clean not in the solution will not grow crystals. If you don’t have enough liquid to submerge the pipe cleaner then make up the solution again with the same ratio. Topping it up with water will dilute the solution and not create solis crystals. Our crystals began growing within the hour, which made it wonderfully exciting for my girls to observe. For those children who are interested in the science behind how the crystals grow, here is a great description. I did remove them after 48 hours and did find that some of them grew so large and had so many crystals on them they were a little hard to pass through the jar opening. 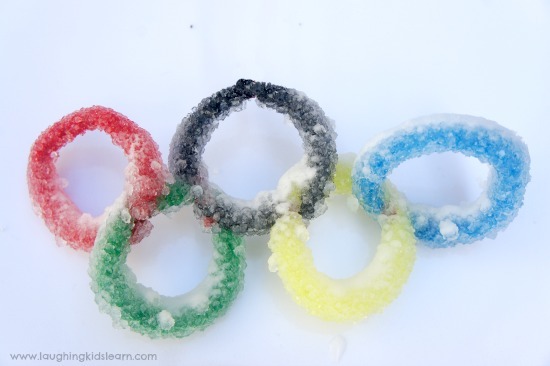 It’s a great idea to keep the size of your Olympic Ring small enough so that, once it does have crystals on it, you will be able to remove it. One of the features of the Olympic rings is the fact that they interlock together, which signifies the 5 continents around the world; Blue (Europe), Black (Africa), Red (America), Yellow (Asia) and Green (Australia/Oceania). I did initially attempt to grow crystals with the pipe cleaners joined together, much like the Olympic Games rings, but it wasn’t as successful. The rings, as the crystals grew on the interlocked pipe cleaners, became too heavy and lost their shape, but it was worth a try. 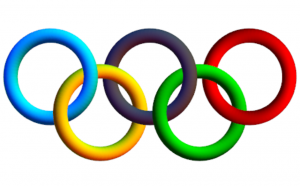 The Olympic Games is only a few days away and it’s exciting to be able to share with my children some of the key features of the games, such as the Olympic rings. Already I have Possum pointing them out when she spots them on advertisements around our local shops or on the television. Don’t forget to make your own Olympic torch too! Are you excited about the Olympic Games too? I love love love your ideas. 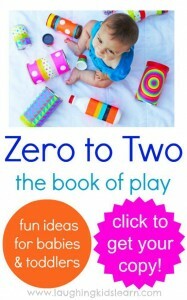 I am the owner of a small playgroup in Johannesburg , South Africa and I have had fun using some of your practical and inexpensive craft ideas. Well done!! And thank you. Love this! Your crystals are beautiful!